Take on your morning commute or carpool for swim practice with a used Subaru Outback! The outback is as rugged as they come, catering to a wide variety of drivers with efficiency, spaciousness, comfort, and great value! Commendable ground clearance and standard all-wheel-drive let you take the Outback on all your great adventures and tackle whatever weather Mother Nature may throw your way. If you have been looking for a used vehicle that can do it all then you have come to the right review! Learn more about the used Outback and all that it can offer by reading down below! Can you highlight some of the features found in a used Outback? Generally, the used Outback is available in six trims each offering a range of features that will please all your passengers. Standard features for the Outback typically include USB and auxiliary audio inputs, a 6.5” touchscreen, air conditioning, roof rails, 17” alloy wheels, a tilt/telescoping steering wheel, a rearview camera, Bluetooth, Apple CarPlay and Android Auto, automatic headlights, hill holding assist an descent control, and a height-adjustable driver’s seat. Other trims generally offer features like dual-zone automatic climate control, leather upholstery, keyless entry and ignition, heated rear seats, navigation, a heated steering wheel, wood grain interior trim, rear air vents, additional USB ports, a larger touchscreen, windshield wiper de-icer, and so much more! What kind of powertrain options are available for a used Outback? Power is typically handled by two engines when it comes to the Outback. The first you may encounter is a 2.5-liter boxer-4 that generates 175 horsepower and 174 pound-feet of torque. If more power is what you are looking for, keep your eyes peeled for an Outback model powered by a 3.6-liter flat-6 that produces 256 horsepower and 247 pound-feet of torque. No matter the engine, your used Outback will send power through a continuously variable automatic transmission. Subaru’s symmetrical all-wheel-drive system is standard on every Outback no matter the model year! Towing does vary by model year but you can expect tow to up around 2,700 pounds. What type of safety and security features are available with a used Outback? The Subaru brand takes safety to the next level, allowing you and your passengers to feel at ease knowing no matter what model year Outback you end up choosing it will be packed with safety features you can count on. Generally, those features include a rearview camera, LED daytime running lights, a tire-pressure monitoring system, traction control system, brake override system, brake assist, 4-wheel anti-locking braking system, and vehicle dynamics control. Passive safety features that can typically be found include a ring-shaped reinforcement frame, collapsible steering column, the LATCH system, rear child safety locks, whiplash protection, driver and front passenger seat cushion airbags, side curtain airbags, the Subaru advanced frontal airbags system, and STARLINK. Your search for the perfect do-it-all vehicle is over! 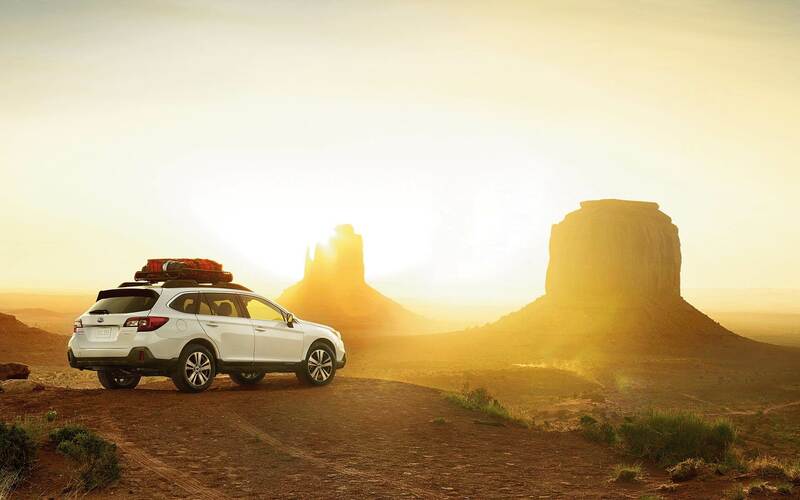 Purchasing a used Subaru Outback model opens the doors to endless adventures with your friends and family. Visit the dealership in person today to peruse all the used Outback models we have in stock with the help of one of our sales associates. They will let you know all about the model you are interested in and take you out for a test drive!